Diabetes is the other chronic ambulatory care sensitive condition for which admission to hospital may signal issues with access or quality of care. However, unlike children with asthma, children with diabetes receive much of their care from specialists. 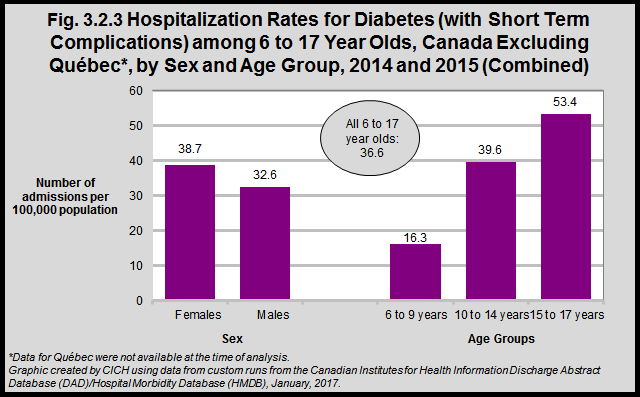 The rate of hospitalization for diabetes with short term complications among children and youth age 6 to 17 years was 35.6 per 100,000 children in the population. The rate of hospitalization increased with increasing age – with the rate of hospitalization among 15 to 17 year olds being 53.4 per 100,000 youth in the population. This reflects in large part the fact that diabetes is more common in older children since this indicator is measured on the whole population and not just those with diabetes. To see the technical appendix for these indicators, click here.